Do you enjoy strategic teamwork, adventurous quests, and crazy characters? Step into the "Salty Suite" - Esports Gaming Center and take your fun seriously with an all new gaming experience. The newest attraction is located inside the Sports Connection - Ballantyne location and features over 50 of the latest Xbox, PS4, Nintendo Switch and Internet Games such as: Fortnite, Super Smash Bros, Call Of Duty, FIFA, Madden and NBA2k. Kids, Teens and Adults will enjoy playing the best titles in our Salty Suite - Esports Gaming Center complete with 8 Large Screen TV's, 6 Gaming Monitors and 2 Large Projector Screens. 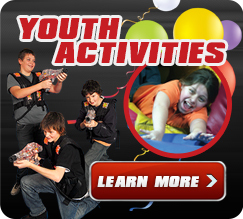 Game Coaches are available at all times to ensure all gamers have a fun and enjoyable time. Give your birthday child an unforgettable experience with some of their favorite games and characters! From doing the "Floss" straight off the Battle Bus to celebrating goals with your "Ultimate" team, our Esports Gaming Center is the most exciting way to amp up the FUN. Each Esports session is 30 minutes long and is considered as 1 Attraction. The Sports Connection Esports Gaming Center can accommodate up to 40 gamers at a time. Other groups or parties may be in the Esports Gaming Center during your party. We recommend at least 60 minutes for Esports Parties for all kids to fully experience all the different games and gaming consoles in the Esports Gaming Center. Esports Parties can choose to play a variety of games on Xbox, Playstation or Nintendo Switch. Most of our games can accommodate multiple players at once. For single player games, like Fortnite, players may need to take turns playing. We try to foster a social and interactive gaming experience, so we have a limited the number of single player games in our library. Special Group Rates and Room Rentals are available for Large Groups, Corporate Outings, Youth Groups and Other Organizations. Contact us for available times and package prices.